We shall indeed call him by his rightful names: Isidore Chukwudozi Oghenerhuele Okpewho, foremost scholar of African oral literature, award-winning novelist, distinguished academic, and devoted husband and father. Okpewho was the author of five scholarly monographs, four novels, numerous articles and book chapters, and was the editor of over half a dozen anthologies. For his monumental contributions, he was the recipient of prestigious awards such as the Nigerian National Order of Merit (NNOM), the Guggenheim Fellowship, the ALA’s Fonlon Nichols Award, and many other international honors. Okpewho was the epitome of a man of letters for both his scholarship and fictional works are deep examinations of the African human condition, and combine expert analysis with shrewd acumen and a sophisticated knowledge of African literary traditions. He was the fine example of the scholar as an artist, or vice versa, as he eloquently argued in his important inaugural lecture: “The Portrait of An Artist as a Scholar,” delivered at the University of Ibadan in 1989. His first scholarly installments, The Epic in Africa: Towards a Poetics of Oral Performance (1979), and Myth in Africa: A Study of Its Aesthetics and Cultural Relevance (1983), constitute groundbreaking works in African Oral Literature, and established him as a giant in the field. Recognized by his peers as an organized and poised leader, he served as President of the International Society of Oral Literature in Africa (ISOLA) from 2002 to 2006. He was also an accomplished fiction writer whose third novel, Tides, won the (British) Commonwealth Writers Prize for Africa. His last novel, Call Me By My Rightful Name (2004) testifies to Okpewho’s deep knowledge of the African Diaspora, and bridges his artistic persona with his scholarship in its sophisticated analysis of the legacies of slavery both in the Americas, and in Africa. Many do not know that Okpewho was also a poet and even tried his hand at filmmaking. He was born on November 9, 1941 in the town of Agbor in the Delta State of Nigeria to David Okpewho and Regina Attoh. Both his parents were from Delta State but of different ethnicities. His father was Urhobo and his mother was Ibo. He spent most of his childhood in his mother’s hometown of Asaba in the Igbo-speaking part of the state, where he attended St. Patrick’s College. He later moved to Ibadan and attended Government College, which was then part of the University of London, graduating with a B. A. in Classics (First Class Honors) in 1964. It was in Ibadan that he met the legendary poet and playwright J.P. Clark whose work would later influence Okpewho’s scholarship. In fact, Clark’s translation of the Ozidi Saga (1977) inspired Okpewho’s last scholarly book, Blood on the Tides: The Ozidi Saga and Oral Epic Narratology (2014). Okpewho worked briefly at Longman Publishers, where he also published his first novel, The Victims (1970). He was then admitted to the University of Denver where he received a Ph. D. in Comparative Literature in 1976. He also received a D. Lit. in Humanities from the University of London in 2000. From 1974 to 1976, Okpewho taught at SUNY Buffalo. In 1976, he returned to Nigeria and taught at the University of Ibadan where he served as Associate Dean of Graduate Studies from 1979 to 1981, and chaired the English Department from 1987 to 1990. After a brief stint at Harvard University, Okpewho joined the faculty of SUNY Binghamton and served as chair of Africana Studies from 1991 to 1997. He was also a faculty in the departments of Comparative Literature and English. In 2004, he was recognized with a SUNY Distinguished Professorship in Humanities. 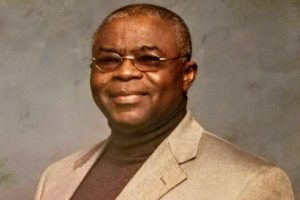 Okpewho retired from teaching recently, and passed away on September 4, 2016 in Binghamton, NY. He is survived by Mary, his wife of 42 years, their four children, and seven grandchildren. Blood On the Tides: The Ozidi Saga and Oral Epic Narratology, Rochester: Rochester University Press, 2014. Once Upon a Kingdom: Myth, Hegemony, and Identity, Bloomington: Indiana University Press, 1998. African Oral Literature: Background, Character, and Continuity, Bloomington: Indiana University Press, 1992. Myth in Africa: Its Aesthetics and Cultural Relevance, Cambridge: Cambridge University Press, 1983. The Epic in Africa: Toward a Poetic of Performance, New York: Columbia University Press, 1979. Call Me By My Rightful Name, Trenton: Africa World Press, 2004. The Last Duty, London: Longman, 1981. The Victims, London: Longman, 1970. American editions: Garden City: Doubleday Anchor, 1971. Washington, DC: Three Continents, 1980.